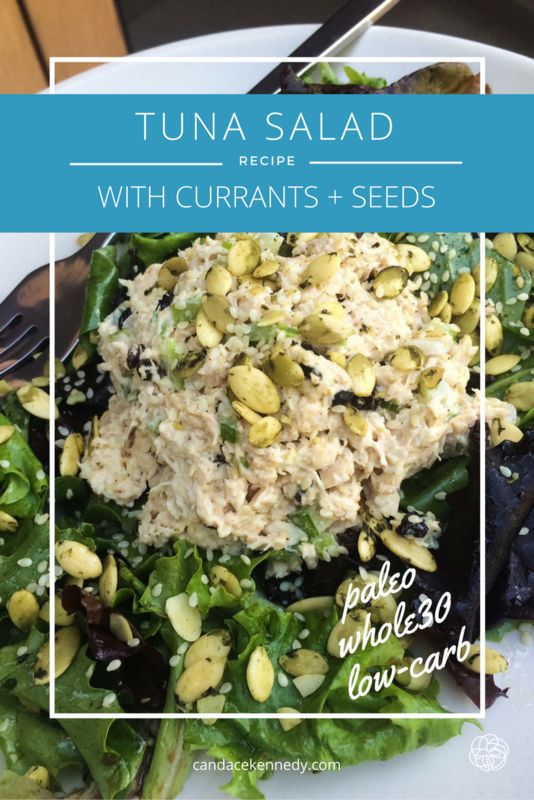 Tuna salad, a lunch staple. Although sometimes lunch staples can start to feel a little boring. This fun twist on a lunchtime favorite combines the sweetness of currants with the crunch and nutty flavor of sesame seeds and sprouted pumpkin seeds, all over a bed of fresh greens tossed in a flavorful vinaigrette. Some people have started to fear this canned meat, due to tuna’s mercury content and BPA-lined cans. I wrote off tuna for awhile for the same reason. However, several companies, including Wild Plant and Safe Catch, have developed methods for harvesting and canning their seafood that minimize or eliminate these concerns. They also emphasize sustainability, an important matter since overfishing has become a huge issue throughout the last few decades. That’s great news since tuna has so many health benefits to offer. It is a great source of protein, selenium and vitamin B12. You’ll also find a good amount of EPA and DHA omega-3 fatty acids in tuna, anti-inflammatory nutrients that are important to your mood and brain function. Let’s not forget about those flavorful and crunchy seeds! Sesame seeds are very nutrient-dense. These tiny seeds are rich in methionine and tryptophan, lignans, fiber, B-vitamins, and minerals. If you caught the post on The Best Foods to Support Your Liver, you may remember that methionine is an important amino acid for both Phase I and Phase II liver detox. Tryptophan is an important precursor to your neurotransmitter (NT), serotonin. This NT plays a key role in regulating your mood, sleep-wake cycle, motor control, immune function, and appetite. Sesame seeds have a very high oil content, which makes them more susceptible to rancidity. Make sure you’re buying from a trusted brand and try storing your seeds in the fridge or freezer, to minimize oxidation of the oils. Ready to start cooking and, of course, start eating? Prep the salad: Combine the red wine vinegar, balsamic, olive oil, shallot and maple syrup in a small bowl. Once it is well-combined, toss 1-2 T of it with the mixed greens. Save the rest for later! Prep the tuna: Combine all of the ingredients for the tuna. Give it a good stir. Taste test. Add salt or more mayo, if needed. Plate your dish: Place your greens on a plate. Add a scoop of tuna on top of the greens. Sprinkle the seeds on top. Looks so yummy. Now I want a snack. Will probably go eat something terrible for me, though.